The Ontario Autism Program (OAP) offers you and your family a variety of evidence based behavioural services. You have a choice. You can either receive services through your local regional provider (also known as your "single point of access"), or you can receive funding to purchase behavioural services through a private provider. Whatever service option you choose, you will have a central role in all decisions related to your OAP services. You will want to work with a clinical team that is the best fit for your family. The following information will help you understand the roles, responsibilities and qualifications of your OAP clinical team members, so that you can feel confident that you are receiving high-quality, evidence based services delivered by experienced and knowledgeable professionals. Regional providers also offer "foundational services" for families. These include parent seminars, workshops, and support groups. These services are not part of evidence based behavioural services and are not led by your clinical team. You can ask your regional provider for more information on foundational services. What are evidence based behavioural services? The OAP funds evidence based behavioural services. “Behavioural services” refers to services that teach children and youth the skills they need to participate at home, at school, and in the community. These services can help to encourage functional and socially important skills, such as getting dressed or talking to other people. These services can also help to discourage challenging behaviour that interferes with learning and wellbeing, such as self-harm or aggression towards others. Behavioural services also involve teaching parents/caregivers the skills they need so they can support their child’s development and address needs as they arise. We can classify a wide range of services with different names, methods used, and approaches, as “behavioural” or “behaviourally-based.” Most of these services are based on the science of Applied Behaviour Analysis (ABA). “Evidence based” means that there is high-quality scientific research showing the service has proven to be effective. It also means that your clinical team recommends the service as appropriate for your child, based on the team’s clinical expertise, as well as your family’s interests, goals, preferences and needs. Each child or youth in the OAP will have an OAP Behaviour Plan. Your OAP Behaviour Plan will describe in detail the evidence based behavioural services your family will receive. Your clinical team will prepare the Behaviour Plan, together with you and with other professionals involved with your child. As the clinical team develops the Behaviour Plan, ask them to explain how each recommended service is behavioural and evidence based. Who provides my OAP evidence based behavioural services? You have a choice. You can either receive services through your local regional provider, or you can receive funding to purchase evidence-based behavioural services for your child or youth through a private provider. Whatever service option you choose, you will receive OAP evidence based behavioural services from an OAP clinical team. You may have only one person on your clinical team, or you may be working with many individuals. This will depend on your child’s needs, the type of services you are receiving, and the size of the organization you are working with. The structure of your Clinical Team will depend on the needs of your family, and the services you are receiving. Every clinical team will have a Clinical Supervisor, but not every team will have front-line therapists, or a professional with specialized expertise. A Clinical Supervisor leads every clinical team. This person is an expert in the science of Applied Behaviour Analysis and is responsible for developing and overseeing your OAP Behaviour Plan. The Clinical Supervisor may have a different title, such as Clinician-in-Charge or Clinical Director, or something similar. If you are receiving direct funding to purchase services for your child from a private provider, your hiring process will start with the Clinical Supervisor. Often, your clinical team will include staff members who are directly delivering services to your family under the guidance ("clinical supervision") of the Clinical Supervisor. Known as "front-line therapists," these team members can have different titles, professional backgrounds, and responsibilities depending on their experience, education and the type of services you are receiving. ABA Therapists (also known as Instructor Therapists, Junior Therapists or Behaviour Technicians) who are more junior, and may receive clinical supervision from a Senior Therapist. You may work with different front-line therapists over time, as your child’s needs evolve or changes are made to your OAP Behaviour Plan. There are many types of evidence based behavioural services that require special training and experience. For example, there is a behavioural service called Pivotal Response Treatment (PRT). If a person wants to deliver PRT services, they must go through a formal PRT certification program. Similarly, a clinical team working with a child/youth with Autism Spectrum Disorder (ASD) who has complex needs, including motor delays, may benefit from a collaboration with an Occupational Therapist around goals such as feeding, toileting and dressing. As an expert in the science of ABA, your Clinical Supervisor should understand and be able to recommend a range of evidence based behavioural services for your family, even if your Clinical Supervisor does not have special training in or experience with all of those services. Just like your family doctor may recommend that you see a specialist, your Clinical Supervisor may suggest that your child see a professional with specialized expertise. This usually happens when your Clinical Supervisor has the training to deliver some, but not all, of your recommended services. The Clinical Supervisor does not supervise the professional with specialized expertise. Instead, they collaborate on common goals and work as partners to coordinate your OAP services. The relationship will be unique to your child’s individual needs. Your Clinical Supervisor may simply consult with the professional with specialized expertise, or your child may work directly with the professional with specialized expertise. If you are working with a professional with specialized expertise, your OAP Behaviour Plan will identify this person and his or her role. Ask your Clinical Supervisor to explain the roles and responsibilities of all clinical team members. It is especially important to understand how your Clinical Supervisor will supervise front-line therapists, and how often, and how the Clinical Supervisor will collaborate with you and with other professionals. While you may work mainly with your front-line therapists, or a professional with specialized expertise, your Clinical Supervisor should have ongoing contact with you and your family, and should be actively involved in all aspects of your OAP Behaviour Plan. For more information on the roles and responsibilities of your OAP clinical team, see Section 5.4 of the OAP Guidelines. What about my OAP Family Support Worker and OAP Family Team? You may be working with an OAP representative to help you navigate both the OAP and the wider service system. This person may be called an OAP Family Support Worker (FSW), or something similar. The FSW is not a member of your clinical team, but he or she is expected to collaborate with your clinical team in a way that makes sense for your family’s needs. The FSW will work with the clinical team on your Family Service Plan, which will describe in detail your family’s priorities, goals and services (OAP and non-OAP). You may also choose to create an OAP Family Team. The FSW can help with this. The OAP Family Team helps to support your Family Service Plan, and coordinate the broader range of services (OAP and non-OAP) your child may be receiving. Your family decides who participates on the Family Team (for example, teachers, other family members, community support workers). A member of your clinical team should be a member of your OAP Family Team. For more details on the Family Support Worker and the Family Team, see the OAP Clinical Framework. How will my OAP Clinical Supervisor collaborate with professionals outside the OAP? You may be working with a number of people outside the OAP, such as psychologists, physicians, speech language pathologists, occupational therapists, physiotherapists, educators, social workers, and/or respite providers. Your OAP Family Service Plan will describe these services in detail. Some of these people may also be members of your OAP Family Team, if you decide to create one. Your Clinical Supervisor is responsible for the evidence based behavioural services described in your OAP Behaviour Plan. However, your Clinical Supervisor should be aware of any other services you are receiving outside the OAP in order to fully understand your child’s needs and strengths, and coordinate your goals. Your Clinical Supervisor and these other professionals should collaborate in a way that makes sense for your family and the type of services you are receiving. For example, with your consent, your Clinical Supervisor may set up meetings or phone calls or e-mail these professionals to discuss your child’s goals and progress. In some cases, your Clinical Supervisor may wish to observe these professionals working with your child or youth. Why does the OAP require certain qualifications for OAP Clinical Supervisors? The OAP requires Clinical Supervisors to have specific qualifications so you can feel confident that your child is receiving consistent, high-quality behavioural services, delivered by experienced and knowledgeable professionals. Clinical Supervisors who do not have the qualifications can continue to provide OAP services as long as they are working towards the qualifications within a specific timeframe. What qualifications should I be looking for? Follow a professional code of conduct (e.g., Behavior Analyst Certification Board® Professional and Ethical Compliance Code, Ontario College of Psychologists Standards of Professional Conduct). The education of front-line therapists varies, and could include some combination of university or college education, certification with the Behavior Analyst Certification Board®, or practical experience. Generally, people who work in the autism field have a university degree or community college diploma in a related field such as sociology, psychology, behavioural science, early childhood education, or child and youth work. The OAP Guidelines recommend some front-line therapist qualifications to look for. Your Clinical Supervisor is responsible for confirming all your front-line therapists have the appropriate qualifications for the services you are receiving. Ask your Clinical Supervisor to walk you through the qualifications of your front-line therapists, and explain how you can verify or check these qualifications. Your Clinical Supervisor may wish to collaborate with a professional with specialized expertise as part of your child’s OAP Behaviour Plan (see Question #2 for a description of the role of the professional with specialized expertise). The qualifications for professionals with specialized expertise vary depending on the services you are receiving. Your Clinical Supervisor is responsible for confirming that this professional has the appropriate qualifications for the services you are receiving. Ask your Clinical Supervisor to explain these qualifications to you, and how you can verify these qualifications. For more information on the qualifications for OAP clinical team members, see Section 5.4 of the OAP Guidelines. How can I verify the professional credentials of my clinical team? Ask your Clinical Supervisor to walk you through the qualifications of your entire clinical team, and explain how you can verify these qualifications. Does the OAP verify my clinical team’s qualifications? At this time, the OAP does not verify the qualifications of any OAP clinical team member. All Clinical Supervisors must self-report their credentials through the OAP Clinical Supervisor Attestation form that is attached to your child’s Behaviour Plan. Employers such as government-funded agencies or private agencies may also verify qualifications when they hire clinical team members. Ontario will introduce an OAP Provider List in 2018 to make it easier for families to find and verify the credentials of behavioural service professionals. The OAP Provider List will check that any Clinical Supervisors who wish to be on the list have or are working towards the required qualifications, as outlined in the OAP Guidelines. More information about the OAP Provider List will be available in 2018. What should I do if my clinical team does not have the qualifications outlined in the OAP Guidelines? At this time, Clinical Supervisors who do not have the qualifications outlined in the OAP Guidelines can continue to provide services as long as they are working towards the qualifications within a specific timeframe. If your Clinical Supervisor does not have the required qualifications, they will need to explain how they are working towards these qualifications, and within what timeframe, on the OAP Clinical Supervisor Attestation form. In the long-term, all Clinical Supervisors will need to have the required qualifications. Ontario is looking at ways to help more professionals get these qualifications and will share more information about specific timelines in 2018. At this time, there are no qualification requirements for front-line therapists or professionals with specialized expertise, apart from having a valid Vulnerable Sector Screen/police check. Where can I find qualified Clinical Supervisors? Autism Ontario’s ABACUS website is a good place to start looking for a Clinical Supervisor. 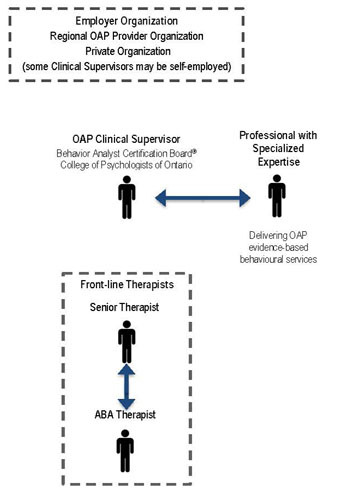 This website contains a searchable list of behavioural service professionals in Ontario, including those qualified to be a Clinical Supervisor in the OAP. Each professional self-reports their qualifications. Neither Autism Ontario nor the Ministry of Children and Youth Services monitor or verify these credentials. Always be sure to verify the professional credentials of your OAP clinical team members. It may also be helpful to speak to other families when you are looking for a Clinical Supervisor. How are these professions regulated? Ontario is exploring ways to enhance the oversight of behavioural service professionals. However, there is currently no governing or regulatory body in Ontario that uniquely oversees the behavioural services field, including Applied Behaviour Analysis (ABA). Some behavioural service professionals are Psychologists or Psychological Associates who have a specialization in Applied Behaviour Analysis. These individuals are regulated health professionals with the College of Psychologists of Ontario (CPO). What skills and experience should I look for? Your first meeting with the Clinical Supervisor should give you a good sense of their skills and experience. Clinical Supervisors should be open about their professional background and areas of expertise. They should be willing to refer to you to another professional if they do not have the skills and experience you’re looking for. Look for a Clinical Supervisor who has, or is working towards, at least 3,000 hours of post-certification/registration experience (typically completed over two years) delivering Applied Behaviour Analysis services to children and youth with Autism Spectrum Disorder. This should include a minimum of 1,500 post-certification hours involving supervisory duties. The OAP Guidelines also provide recommendations on the experience levels of front-line therapists. You should also learn as much as you can about the specific work experience of your clinical team members. Ask your Clinical Supervisor what experience and training the clinical team has working with children like yours, what experience they have with clinical supervision, and what methods and approaches they use. You may also find it helpful to speak with other families who have used their services. Autism Ontario’s ABACUS website has information to help guide you in this process, including questions to ask during phone interviews, in-person interviews, and reference checks. How can I check that my clinical team is ethical and safe? Are they listening to my family’s priorities? Are they communicating to me clearly? Does the recommended amount of service seem right for my child, and manageable for my family? Is the cost of service reasonable? You can ask your Clinical Supervisor about their policies related to safety, as well as ethical billing and administrative practices and standards. All members of your clinical team should also have a valid Vulnerable Sector Screening/police check, which is a standard requirement for professionals who work with children and youth. If you are concerned about your clinical team, you have a number of options to address the issue (see Question 16). What are the warning signs that I need to check out a clinical team more carefully? Are defensive, unclear, or vague about their background or credentials. Use methods that appear unconventional or are not backed by scientific evidence. Do not tie recommended services to assessment results, specific goals, evaluation criteria or outcomes for your family. Offer guaranteed results, or claim that their approach works for everyone. Insist on an unusual billing arrangement, or service contract. How can I check that my clinical team is doing a good job? Autism Ontario’s ABACUS website provides information on how to evaluate and monitor your clinical team’s performance. I’m unhappy with my clinical team. What can I do? Start by speaking with your Clinical Supervisor to try to resolve the problem. Your relationship with your Clinical Supervisor should be an open and collaborative partnership built on mutual trust and respect. Your Clinical Supervisor should listen to your concerns and work with you to constructively address any issues. If you are unhappy with one of your front-line therapists, your Clinical Supervisor may have ways to address the issue through clinical supervision or reassigning duties to another provider. If you are receiving services from a professional with specialized expertise (See a description of this role), your Clinical Supervisor should help to mediate any issues, or refer you to a different professional, if necessary. If you are unhappy with your Clinical Supervisor, or some other aspect of the organization, and are unable to resolve the issue through discussion with your Clinical Supervisor, ask your OAP Family Support Worker for advice. Employers such as ministry-funded agencies may also have a complaints process.